These patented devices revolutionized pulley use when they were introduced in 2005. The Omni-Block combines a pulley with a swivel and offers tremendous advantages. 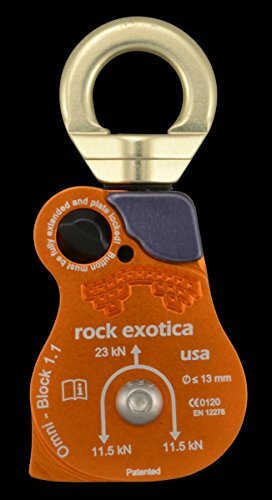 It can replace a conventional pulley, carabiner & swivel and is lighter, less expensive and saves valuable vertical space. 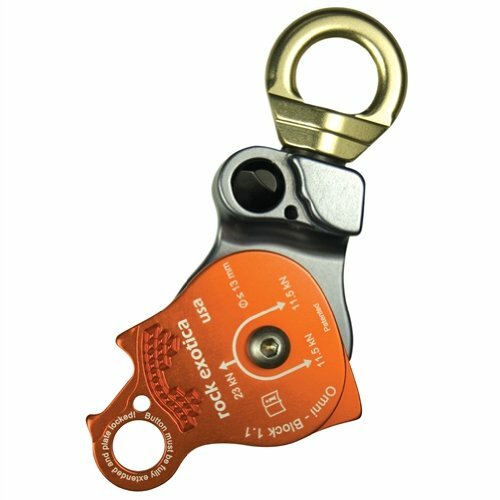 It also allows installing/removing the rope while the pulley is still anchored.While the standard version serves the needs of most users, the Omni is also available with some specialized options. Inside that block of aluminum is an Omni just waiting to get out. Like Michelangelo, all Rock Exotica has to do is remove the unwanted material. Unlike Michelangelo, Rock Exotica has a 4 axis, 20,000 RPM horizontal machining center with RISC processor to do it.